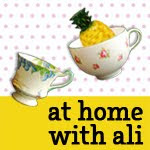 At home with Ali: Is it an active volcano? Is it an active volcano? Cakey had her first sleepover when her lovely 5 year old friend came to stay. We decided to do a craft project that stretched over the two days. On the afternoon of arrival, the girls sat down at the coffee table with a big box of textas and an A1 size piece of blue card (210gsm) each. I asked them whether they would like to make submarine volcanoes. The answer was 'yes'. I suggested that first they should draw their underwater scenes – fish, plants, squid, sharks etc. (Note: the reason we made underwater volcanoes was because I only had blue card). The following morning we turned their underwater pictures into submarine volcanoes. I twisted each piece of card into a cone shape and used a stapler and some sticky tape to hold them in place. I then trimmed the bottom so that they would stand up unassisted. Next we did some research on the computer ie. looking up images of volcanoes. We discussed the difference between active, dormant and extinct volcanoes. Both girls decided that they wanted to make active volcanoes as they liked the pictures of volcanoes spewing lava. We ripped up some pink tissue paper and cut up some strips of red florist paper to make the lava. 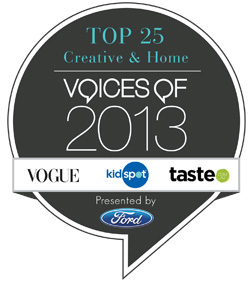 Using pva they glued the lava onto their volcanoes obscuring all their wonderful drawings. Although the girls did enjoy this activity they only got super-excited when we were looking up volcanoes on the computer. Now every time we go past a small hill, Cakey will ask 'is that an extinct volcano mummy?'. The next time we do a volcano activity I think I might need to find out how we can make it actually erupt, which will be far more exciting. UPDATE – Thanks to Julie who provided this information on how to make an erupting volcano: "Vinegar and bicarbonate of soda will create a good eruption, you can also add food colouring to it for a different effect. Put the bi carb in a film canister or something similar make the volcano around it to disguise and then add a little vinegar. Beware, it does make a mess!!" Great activity though. And wonderful that it became a learning exercise as well as creative. 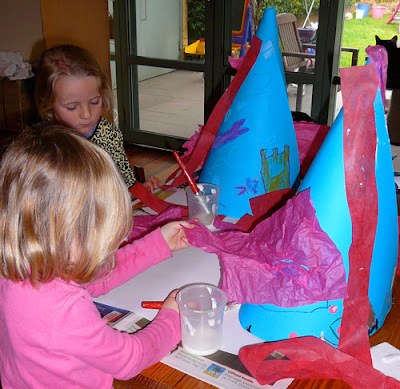 Thanks for your comment Kellie – I have now added info on how to make an eruption thanks to Julie for sharing. this is cool, my boys could do a dinosaur version. think i will stick to the non errupting kind though as that way they can play with it for a few days with their little plastic dinos:) there very own land before time! Great ideas, I love adaptations. Love these volcanos! Why not be party hats too? 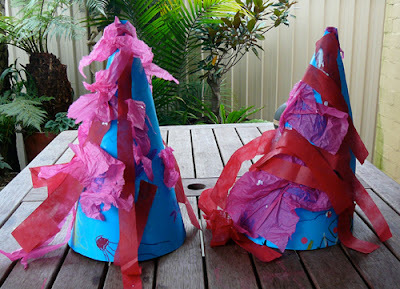 They could be party hats for a prehistoric/dinosaur birthday party!